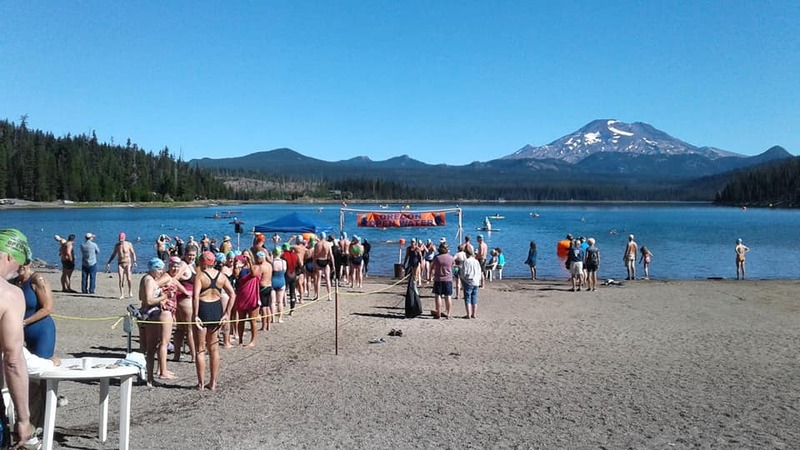 163 swimmers entered the 24th Annual Cascade Lake swim Series this year, and, as usual, the event was a major success. 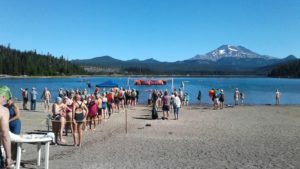 Elk Lake is a spectacular setting for an open water swim event. The water is clear and the scenery is outstanding. Friday evening began with the 3000 meter event. The afternoon wind hadn’t quite died down for the first lap, so we had a little bit of choppy water, but the water temperature was over 70 degrees and was very comfortable without a wetsuit. We followed the swim with chicken wings and a great selection of ripe fruit. Those who were camping were treated to a “blood moon” rising around 9:30 pm. We couldn’t see the actual eclipse, but the moonlight lit the lake in beautiful fashion. A handful of us went for a moonlight swim towing our lighted swim buddies. 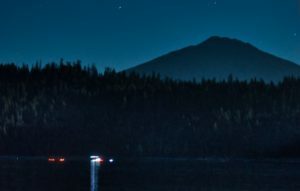 Jessica Kieras wrote about our experience at https://oregonlakebagging.wordpress.com/2018/08/01/night-swim/. For me, it was quite the experience to slip off into the water at night with a very bright moon over my right shoulder. Halfway to the marina, there was suddenly a second, even brighter light just by the moon. I stopped to look, and had the sensation that the second light was only 10 feet away and was looking at me. About that time, Mike Tennant started laughing, and I realized it was his headlamp from his paddle board, and not something from the X Files. Saturday morning was bright and warm. We started with the 500 meter time trial. Some of us were quite inept at coming up with our seed times for the time trial, but we all got to swim and learn first-hand that the shortest race of the swim series is the hardest and most painful! After a break, we were back in for 1500 meters. Again, we had perfect conditions, followed by, what else, a great meal. Then, there was lounging on the beach for the rest of the afternoon. What a great way to spend a day. Sunday morning continued with ideal conditions for the 5000 meter event. One diamond, 2 triangles. If you’ve done this race, you understand. While the 500 meter race is the hardest, the 1000 meter race is the hardest to start. Lots of groaning and aching muscles at the start fade as the race progresses. After the race, more food and the award ceremony. Chad Hagedorn and Alexis Higlett were the winners of the short series (the 500, 1000, and 1500 meter races), while Michel Heijen and Jessica Kieras were champions in the long series (1500, 3000, and 5000 meters). A total of 68 swimmers completed the survivor series (all 5 distances). Thank you, Bob Bruce and Barb Harris, COMA volunteers, our safety boat spotters, and power boat crew, paramedics, all of the event sponsors, and Bend Parks and Rec for putting on a great event. Look at you writing articles now… way to go!